The Footlight Players of Charleston, South Carolina presented Nusense, the musical comedy, for Piccolo Spoleto 2016. Historically, the venue is in an old cotton warehouse (circa 1850) at 20 Queen Street which was converted into a Playhouse in 1986. 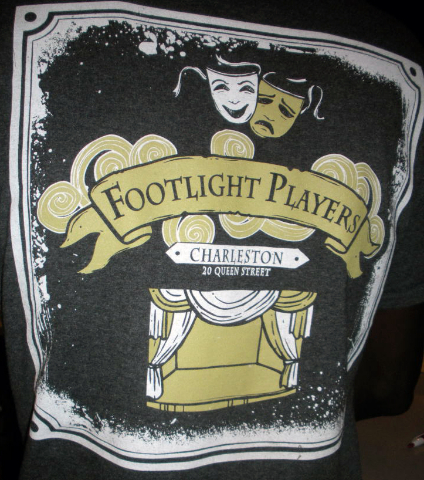 The Footlight Players is one of the oldest performing community theatres in South Carolina. With Donald Brandenburg as artistic director and Jane Broadwater as executive director, The Footlight Players have kept up their professionalism and appealing offerings to an appreciative community. 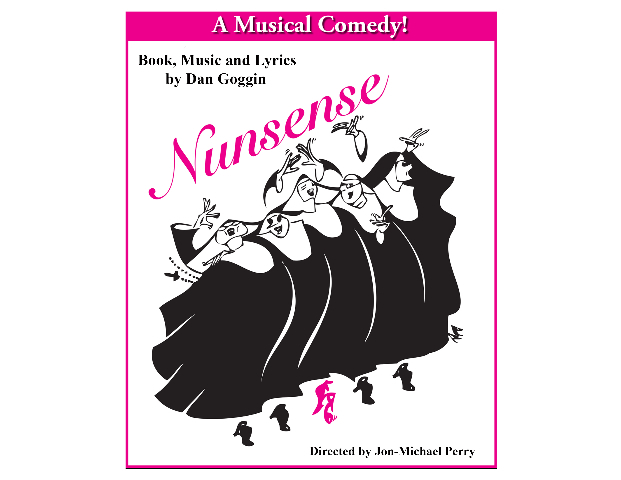 This Nunsense production was mounted with five multi-talented ladies who could sing, dance, tell jokes and entertain us. Their traditional, Catholic nun habit costumes though looking hot, uncomfortable and cumbersome, didn't distract from their acrobatic dance routines and running amuck in the audience. That was a miracle! The storyline is thus: Five of the 19 surviving Sisters of Hoboken haven't been buried yet due to lack of funds. There was a food poisoning incident that killed fifty-two nuns who ingested Chef Sister Julia, Child of God’s, vichyssoise soup. As a result, they plan to raise money by putting on a Variety show. We get to see the many talents of each of the five nuns individually and in cast numbers. The head of this talented group is Reverend Mother/ Sister Mary Regina played by humorous and mad-cap Madelyn Knight. Nothing weighed her down. She doesn't let you forget her high-wire circus background for a skinny minute. Knight opened Nunsense with an enormous burst of energy that she managed to maintain throughout the show. Even when she got high on speed, she kept the show moving along briskly with singing, dancing, joking with the audience and being a happy camper. Her solo “Turn up The Spotlight" was sensational and she blended well with all the cast's ensemble acts. The side-kick of Reverend Mother was her trusty helper Sister Mary Hubert played by S.E. Coy her best number with cast was "Tackle That Temptation With A Time Step" and she knew how to tap her way to get much deserved applause. The aspiring ballerina/novice nun Sister Mary Leo, played by Jennifer Kliner, started on-point ballet arising from her lonely, humble bed holding a teddy bear. Her dancing abilities shined through. With a ventriloquist nun-look-a-like puppet, Sister Mary Amnesia played by Shelly Goughnour, was able to have her alter ego displayed by the puppet. She was at a loss for her true identity. Her solos were "So You Want To Be a Nun" and show stopper "I Could've Gone to Nashville". Amnesia's puppet helped express real feelings and we all rooted for her ability to finally find herself. The nun who aspired so diligently for actual show biz stardom showed off her talent well with singing two solos "Playing Second Fiddle" and " I just want to be a star." This was Sister Robert Anne played by Ingrid Santiago with unique pizzazz. This hugely successful, multi-award winning musical sets the bar high. There were no sets or stage gimmicks. It was just five nuns in their habits on a black-box stage or in front of the curtain. 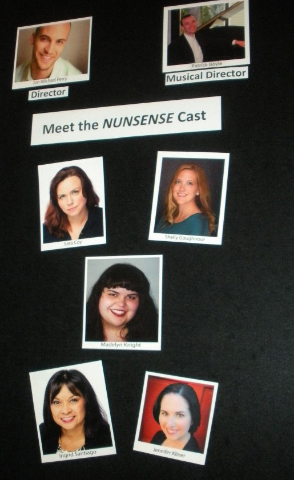 You know you have to be super talented to pull this off as well as this Nunsense cast did. These five ladies used all the tricks of the trade, and then some, to draw the audience into the drama. Holy Spirit permeated the theatre and the cast nailed the finale with "Holier Than Thou" that crept into my psyche as we exited. The show would not have been such a hit without the multi-talented director and choreographer Jon-Michael Perry at the helm. He brought to life the book, music, and lyrics of Dan Goggin most admirably. The excellent accompaniment of music director Patrick Boyle kept up with the ladies’ numbers majestically. Rebecca Carner designed the habits while the sound of George Perrotta and the lighting of Jesse ONeil made every technical aspect work to perfection. What a hilarious and joyful afternoon we spent with Nunsense. It was so much fun watching this production that I had a hard time leaving its entertainment comfort zone.